There are many options available for adding privacy to your yard, from strategically-placed bushes to thick wooden fences. If you are looking for a more elegant and stylish option, consider a lattice fence or screen for your privacy needs. A lattice screen consists of overlapping strips of wood to create a hashed appearance, with openings in the fence typically between a half-inch to a full inch in size. The common image of a lattice fence is one with diamond-shaped openings, but square or rectangular openings are possible as well. For added flexibility, screens can be free-standing partitions or integrated into decks. In all cases, a private lattice fence can add a more appreciable look to your yard or garden while keeping outside eyes away (it can even block your view from an unpleasant neighbouring sight). A lattice screen can be used to enhance a garden by letting vines or climbing plants grow along the spacing. Regardless of whether you want to install the lattice screen yourself, or hire a fence contractor, there are a few things you need to consider when getting your own private lattice fence. Material: Lattice panels can be made out of wood or plastic, and each category can be further divided by colour, texture, and grain. Try to picture what you want the finished product to look like. Some lattice fences use the same material throughout, while other homeowners like to use different materials for the supports to add a more unique, customized appearance. 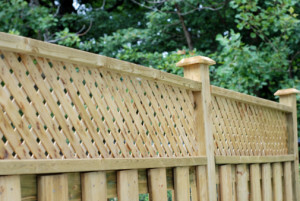 Posts: The style of your private fence’s posts is just as important as the lattice itself. Do you want thin and less obtrusive connections, or do you prefer something bolder, such as a pillar style? If you are unsure what will look best with your property, it’s best to consult with your fence contractor. Your deck: If you have a deck, consider integrating your screen into it. Whether integrated into the railings, used to create an overhang or to simply cover up a space to keep out raccoons—the lattice should use similar or complimentary materials to the deck’s framework. Plants: Although the goal of a privacy fence is to provide privacy, you may need the openings in your fence to be larger than one inch if you want to grow plants along it. Three-inch openings are usually best for supporting vines or climbing plants, and the greenery will further improve the privacy provided. Total Fence Inc. is one of the top fence and deck builders in the Greater Toronto Area. Our expert deck and fence contractors know the best ways to build beautiful lattice screens and privacy fences. Contact us at 416-239-5362 to speak with a consultant and learn more about how we can build you a wonderful private fence, or about how you can get materials to make your own.